Perhaps as much as 4% of the world’s population depends directly on artisanal mines, which produce around 20% of the minerals we use. This column reports evidence that despite the widespread perception that these mines are largely a threat to the health and environment of local people, they may have a positive impact on local living standards. More attention should be paid to the part that artisanal mines may play in development processes, as well as how they can cohabit with industrial mines. There is a counter-intuitive feeling to the idea that the inhabitants of resource-rich parts of the world are poor. Yet many resource-abundant countries seem to be victims of the natural resource curse, which translates into little economic growth. The curse typically arises from such mechanisms as interest rate variations, rent-seeking, or conflict. Zooming further, the distribution of resources within countries is not uniform. What happens to people living around exploitation sites: do they benefit or suffer more from the resource exploitation? At the local level, natural resource exploitation entails competition for land. Land may serve a variety of purposes, including agriculture, residences, industrial mining or artisanal mining. In recent research, we provide the first large-scale quantification of the impact of artisanal mines on local living standards. We also examine the local impact of recently established industrial mines. Between 2-4% of the world’s population depends directly on artisanal mines, which produce about 20% of the minerals we use. Artisanal mining is a labor-intensive and dusty activity, raising concerns that it ‘may cause severe environmental and health risks, conflict and generally few economic beneﬁts.’ Much of the quantitative research on this issue focuses on the link between artisanal mines and conflicts. We show that artisanal mines may also have positive spillovers. Our analysis of unique data from Burkina Faso reveals that people living around artisanal mines do actually benefit from them. 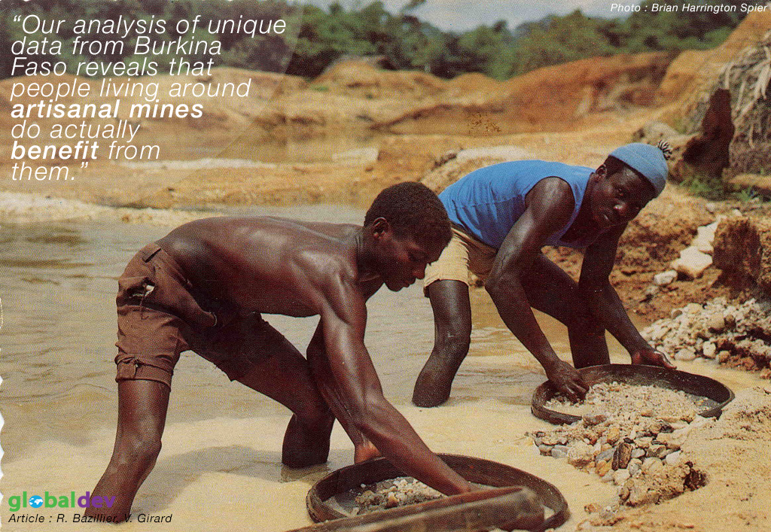 First, gold reserves are scattered all over Burkina Faso, such that some people live close to an artisanal mine, and some don’t. Second, the gold price increased fourfold over the course of the 2000s, so that the benefits of digging for gold have changed over time. We are able to exploit this quasi-natural experiment thanks to detailed information on household level consumption, collected both before and after the increase in the gold price. What happens to people who live next to artisanal mines when the gold price increases? They consume more. Consumption is the best proxy for income in a developing country context; hence, such an increase in consumption is good news. A back-of-an-envelope calculation suggests that a high gold price translates into five additional cents (in euros) of consumption each day, for each person living around an artisanal mine. That amount of additional consumption may seem small at face value. But five cents is a big increase in relative terms: it corresponds to a 10% increase in consumption. In sharp contrast with the local impact of artisanal mines, the opening of industrial mines does not improve local consumption. Yet in 2016, industrial mines contributed 290 million euros to the national budget of Burkina Faso. Despite the scale of production, the local impact of industrial mines is not always granted (even if local content policies, as encouraged by the World Bank, may be successful in some contexts). Industrial gold mines are only ten years old, but they already produce ten times more gold than artisanal mines. Can artisanal and industrial mining be combined? Artisanal mines increase local consumption while posing formalization and taxation challenges to Burkina Faso. Industrial mines contribute to the national budget but, as of 2014, do not improve local consumption. These simple observations may help to understand why local populations may protest at the installation of industrial mines. Our results indicate that there may be an equity consequence, in addition to the efficiency consequence, of opening an industrial mine instead of an artisanal mine. Indeed, artisanal mines are managed like common properties: they are inefficient, but virtually everyone can have access to a share of the gold. Industrial mines privatize the access to gold by enclosing their production areas. Since artisanal and industrial gold mines typically target neighboring but not completely overlapping areas, there is room to improve cohabitation between the two. Victoire Girard is a research fellow in economics at the University of Orléans Labex Voltaire and a contractual lecturer at Paris 1 Panthéon-Sorbonne University. Rémi Bazillier is a Professor of Economics at the Pantheon-Sorbonne University and research affiliate at the Centre d’Economie de la Sorbonne (CES-CNRS). Los beneficios a corto plazo son evidentemente pobres , pero que pasara en un largo plazo cuando los recursos se agoten, cuando las personas que laboran se han acostumbrado junto con su familia a que esa es la única manera de sobrevivir, que sucede cuando las personas se acostumbran a ese estilo de vida, cuando se exponen a tantos riesgos y solo son esclavos de esas condiciones, cuando los benefactores de estas industrias explotan los recursos y la gente, cuando se marchen porque ya no hay que explotar. Me parece que mas que cultura minera artesanal es esclavitud a una condición desgastante, a una vida sin futuro, a la pobreza, a la ruina, a la riqueza de los demás. Todo esto me parece mas un acto de esclavitud que de progreso, supongo que esa es la idea los parásitos se deben alimentar de la ignorancia. Dear Marcela, thank you for your comment and for starting an interesting discussion on the topic. As you might know, GlobalDev just launched a contest inviting researchers, academics, students, decision makers and practitioners from all over the globe to comment, give feedback and start a discussion on any of our GlobalDev’s articles. If you would like us to consider your comment in the contest, please note that following GlobalDev on Social Media is a prerequisite for participating. Make sure you are following our Facebook page, Twitter and/or our LinkedIn group. Please also send us your email address (editors.globaldevblog@gdn.int) so we contact you if you win! Good luck and please keep on reading, commenting and giving feedback on our articles!